A LENGTHY injury list has hindered Wycombe’s campaign. But the queue to the treatment room is at last shortening, so there are real hopes the season can gain momentum. Gareth Ainsworth’s side may be 21st in the League Two table but the talk has been the team is good enough to aim for the play-offs. The manager hasn’t been keen to say too much about that but even he seems to be coming around to that way of thinking. There were decent expectations going into the season. Last season, it tailed off after they hit 60 points and announced they’d reached their target. Ainsworth isn’t quiet about the fact he has one of the smallest budgets to work with. Despite that, he assembled a squad which is good enough to aiming for the top seven. Ainsworth is making all the right noises ahead of the game at Fratton Park, too. He has spoken of being a traditionalist and told of his FA Cup memories. Ainsworth seems to be taking the game seriously and I think it will be a strong side he sends out. There hasn’t been a lot of flexibility in Ainsworth’s squad with all the injuries they’ve carried. Luke O’Nien, Marcus Bean, Paris Cowan-Hall, Scott Brown, Dayle Southwell, Max Muller and Joe Jacobson. It’s been a real long list. Slowly but surely they’re all coming back. Muller’s a long-term problem and Southwell’s a few weeks off but otherwise Ainsworth has a full squad to pick from. Last weekend Will De Havilland came into the side in place of Anthony Stewart. But Stewart and Aaron Pierre are a real solid combination this season and I think they will be needed to combat the likes of Gary Roberts and Conor Chaplin. 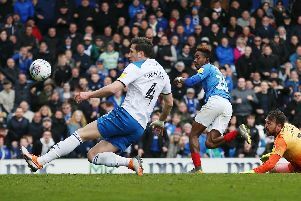 It was a crazy game at Fratton Park a couple of months back. Wycombe actually played pretty well attacking-wise in that match but defensive errors proved costly. Paul Hayes had a good afternoon and grabbed two goals on that occasion. Hayes hasn’t scored since and has been talking in the build-up to the game saying he’s due a couple. It could be the right game for Garry Thompson to come back in, partner Hayes up front and go with two wise, old heads. One to watch is definitely O’Nien. He was a surprise hit last season. There’s also Dominic Gape, who’s on loan from that team Pompey don’t like. He has skill but is still adjusting to the physicality of League Two.